I had dinner at Locanda Verde on Saturday and after a few awesome savory dishes we had three of Karen DeMasco’s comfort-style desserts. The “masterful” Lemon Tart has been on the menu for at least two years and as I have said before it has no peer. 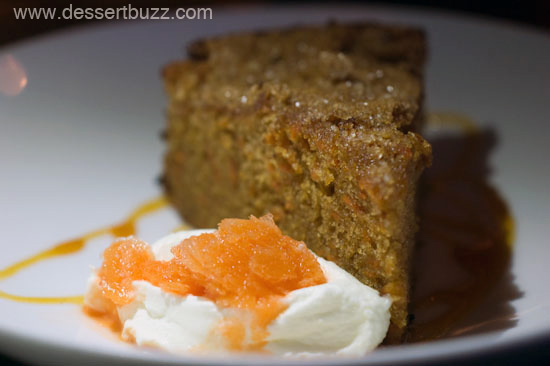 The rhubarb upside-down and carrot cakes, however, were new to me. 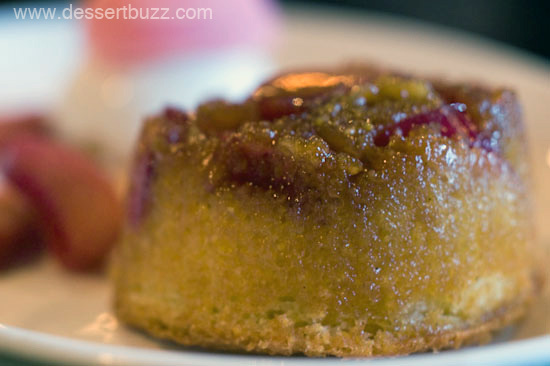 The rhubarb upside-down cake is served warm with a scoop of goat’s milk gelato and some rhubarb mascarpone sorbetto. The cake portion is super-moist and tasted like it has some type of toffee or caramel mixed in with the rhubarb on top or um, on the bottom. Bits of rhubarb are served next to the cake and are cooked to tender perfection. The goat’s milk gelato is subtle and has very little sweetness. 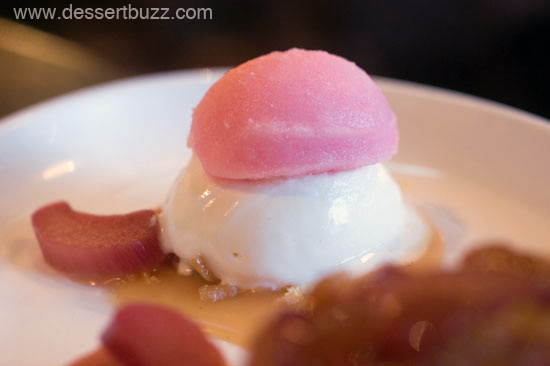 Mascarponse cheese is added to the rhubarb sorbetto to add some creaminess. Even if you don’t like carrot cake try this carrot cake–there are no raisins, big chunks of nuts or long shreds of carrots in this cake–just moist fluffy cake. YES! Had lunch there on Saturday and tried the lemon tart and rhubarb cake….so delicious. 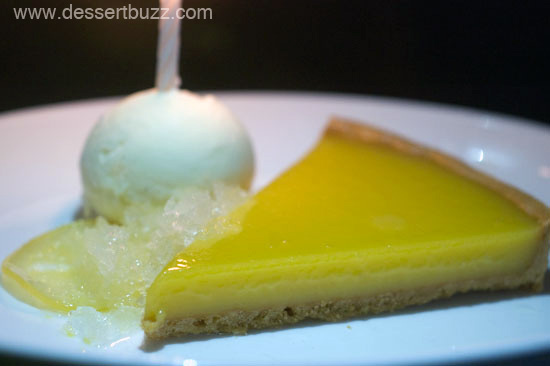 The lemon tart is PERFECT – excellent flavor and texture, complemented very well by the buttermilk gelato. I’ve run out of things to say about the lemon tart.